Symfony is a PHP web application framework for MVC applications. Question: Is Symfony Open Source? Question: What is current Stable version of Symfony? Question: What is offical website of Symfony? Question: What is minimum PHP Version requirement for Symfony? 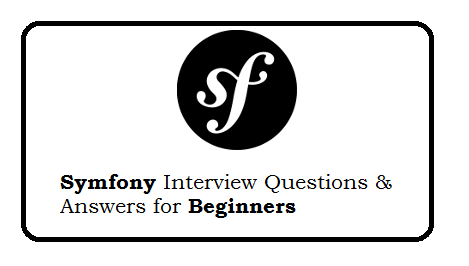 Question: What are benefits of Symfony? Question: How to concatenate strings in twig? Question: How to get current route in Symfony 2? Question: How to render a DateTime object in a Twig template? Question: How to var_dump variables in twig templates? Question: How to get the request parameters in symfony2? Question: How to get list of all installed packages in composer? Laravel Interview Questions and Answers. YII interview questions and answers for fresher.